Home What Is the Role of Robotics and Navigation in THA? Navigation and robotics systems are intended to help improve accuracy of component positioning and reduce outliers in total hip arthroplasty. The authors review the evidence for and against using these systems. Navigation and robotics have recently been introduced in an attempt to improve the reproducibility and accuracy of THA, as well as other orthopaedic surgeries. Navigation systems use patient-specific anatomic data and information about the relative positioning of surgical instruments and implants to convert qualitative human judgments into calculated surgical decisions. Robotic navigation refers to the use of computerized instruments that assist the surgeon in executing specific parts of the procedure. Despite evidence supporting improved accuracy and fewer outliers with robotic THA, it is not yet clear whether these radiographic benefits translate into better clinical outcomes. Navigation systems are classified based on whether they require preoperative imaging and whether they use a robotic assistant. 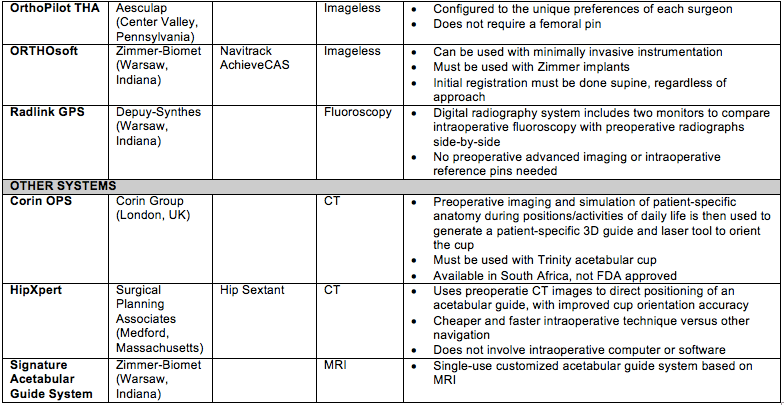 Imageless and fluoroscopy-based navigation systems do not use preoperative imaging and therefore omit steps 1 and 2. Common navigation systems available in the US are listed in Table 1. ]Domb et al  found that 100% of cups placed using the Mako THA robotic system were within the Lewinnek safe zone, compared with 80% of conventionally placed cups. Others have reported limb length restoration to within 6 mm of the contralateral limb in more than 95% of cases,  although there is currently no clear evidence that imageless navigation restores limb length better than conventional THA. Perhaps most importantly, evidence demonstrating improved clinical outcomes with navigation is lacking. Some surgeons argue that in the absence of a clinical benefit, navigation is not worth the extra expense and hassle. Increased cost.Robotic systems require substantial upfront financial investment for the robot and software (up to or exceeding $1 million), as well as annual maintenance and disposables for each case. CT-based navigation is associated with increased cost and increased radiation exposure from the preoperative CT, as well as increased time for preoperative computer modeling. Increased risk of certain types of complications. The first robotic assistant, called ROBODOC, was associated with several major complications when it first launched. In some studies, patients had higher dislocation (18%), revision (15%),  and heterotopic ossification (27% vs 16%) rates  when ROBODOC was used in their surgery, possibly due to abductor damage during robotic milling. Newer robotic systems have not been associated with the problems reported with use of the older systems like ROBODOC. Which Type of Navigation Is Best? Currently available evidence does not definitively support one type of navigation over the others. Each navigation type has advantages and disadvantages, the relative importance of which may depend on the specific surgical case. Benefits of imageless navigation: Compared with robotic navigation, imageless navigation requires less capital investment, spares the patient radiation exposure and the expense of preoperative CT, and requires only minimal set up for each surgical case. Robotic assistants must be designed to accommodate each implant system, and they are typically compatible with only a few implant systems. On the other hand, imageless navigation can be used with most systems. Benefits of image-based and robotic navigation: Image-based navigation (including robotic THA) can improve accuracy through minimally invasive approaches and in obese patients, both of which have been associated with an increased risk of component malpositioning. [20, 21] By contrast, the accuracy of imageless navigation depends on the surgeon’s registration technique. Poorly identified bony landmarks result in poorly placed components, an issue termed “garbage in, garbage out.” Robotic navigation can be especially useful to ensure accurate component positioning in dysplastic hips or in other cases in which normal anatomic landmarks are obscured. Computer navigation and robotic assistance represent new surgical tools with the potential to minimize outliers in component positioning and to assist in challenging cases in which the patient has irregular anatomy. Semi-active robotic systems offer the most accurate patient-specific preoperative planning tools, and they ensure that the plan is executed accurately during surgery. However, robotic systems add considerable cost and radiation, and have a steep learning curve. Imageless navigation systems aid the surgeon in ensuring accurate component positioning and limb alignment intraoperatively, with comparatively less expense and radiation, as well as simpler intraoperative technique. One challenge of evaluating outcomes and efficacy of navigation systems is that computer technology changes so rapidly that it is obsolete by the time long-term clinical data are available. Therefore, studies reporting the outcomes of patients who underwent navigated THA 10 years ago may not accurately reflect today’s technology. Meaningful clinical benefits of navigation may emerge as existing devices develop a track record and as our technology evolves. Amy Wasterlain, MD, is a resident in orthopaedic surgery at the NYU Langone Medical Center’s Hospital for Joint Diseases, New York, New York. Jonathan M. Vigdorchik, MD, is an Assistant Professor of Orthopaedic Surgery, Associate Fellowship Director in Adult Reconstruction, and Co-Director of Robotics in Orthopaedic Surgery at NYU Langone Medical Center’s Hospital for Joint Diseases, New York, New York. Bozic KJ, Kurtz SM, Lau E, Ong K, Vail TP, Berry DJ. The epidemiology of revision total hip arthroplasty in the United States. J Bone Joint Surg Am. 2009;91(1):128-133. Hepinstall MS. Robotic total hip arthroplasty. The Orthopedic clinics of North America. 2014;45(4):443-456. Keshmiri A, Schroter C, Weber M, Craiovan B, Grifka J, Renkawitz T. No difference in clinical outcome, bone density and polyethylene wear 5-7 years after standard navigated vs. conventional cementfree total hip arthroplasty. Archives of orthopaedic and trauma surgery. 2015;135(5):723-730. Beckmann J, Stengel D, Tingart M, Gotz J, Grifka J, Luring C. Navigated cup implantation in hip arthroplasty. Acta orthopaedica. 2009;80(5):538-544. Domb BG, Redmond JM, Louis SS, et al. Accuracy of Component Positioning in 1980 Total Hip Arthroplasties: A Comparative Analysis by Surgical Technique and Mode of Guidance. J Arthroplasty. 2015;30(12):2208-2218. Domb BG, El Bitar YF, Sadik AY, Stake CE, Botser IB. Comparison of robotic-assisted and conventional acetabular cup placement in THA: a matched-pair controlled study. Clin Orthop Relat Res. 2014;472(1):329-336. Elson L, Dounchis J, Illgen R, et al. Precision of acetabular cup placement in robotic integrated total hip arthroplasty. Hip Int. 2015;25(6):531-536. Dorr LD, Malik A, Wan Z, Long WT, Harris M. Precision and bias of imageless computer navigation and surgeon estimates for acetabular component position. Clin Orthop Relat Res. 2007;465:92-99. Davis ET, Schubert M, Wegner M, Haimerl M. A new method of registration in navigated hip arthroplasty without the need to register the anterior pelvic plane. J Arthroplasty. 2015;30(1):55-60. Weber M, Woerner M, Springorum R, et al. Fluoroscopy and imageless navigation enable an equivalent reconstruction of leg length and global and femoral offset in THA. Clin Orthop Relat Res. 2014;472(10):3150-3158. Ellapparadja P, Mahajan V, Deakin AH, Deep K. Reproduction of Hip Offset and Leg Length in Navigated Total Hip Arthroplasty: How Accurate Are We? J Arthroplasty. 2015;30(6):1002-1007. Nakamura N, Sugano N, Nishii T, Kakimoto A, Miki H. A comparison between robotic-assisted and manual implantation of cementless total hip arthroplasty. Clin Orthop Relat Res. 2010;468(4):1072-1081. Renkawitz T, Weber M, Springorum HR, et al. Impingement-free range of movement, acetabular component cover and early clinical results comparing ‘femur-first’ navigation and ‘conventional’ minimally invasive total hip arthroplasty: a randomised controlled trial. Bone Joint J. 2015;97-B(7):890-898. Parratte S, Ollivier M, Lunebourg A, Flecher X, Argenson JA. No Benefit After THA Performed With Computer-assisted Cup Placement: 10-year Results of a Randomized Controlled Study. Clin Orthop Relat Res. 2016. Lass R, Kubista B, Olischar B, Frantal S, Windhager R, Giurea A. Total hip arthroplasty using imageless computer-assisted hip navigation: a prospective randomized study. J Arthroplasty. 2014;29(4):786-791. Redmond JM, Gupta A, Hammarstedt JE, Petrakos AE, Finch NA, Domb BG. The learning curve associated with robotic-assisted total hip arthroplasty. J Arthroplasty. 2015;30(1):50-54. Honl M, Dierk O, Gauck C, et al. 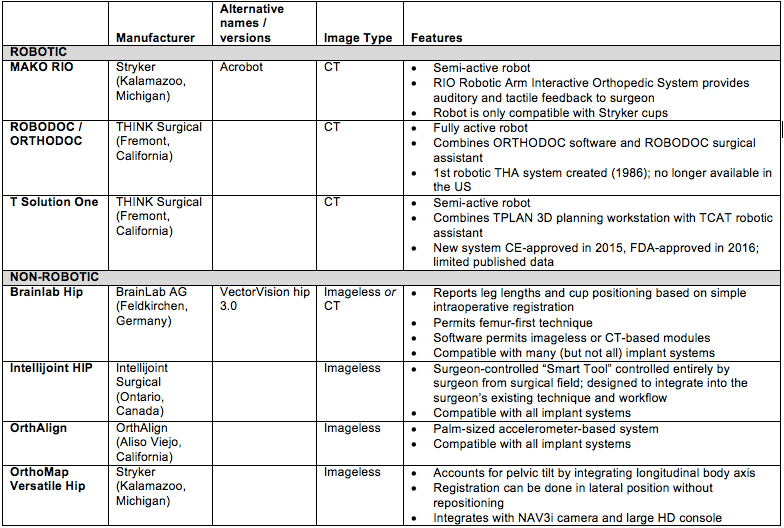 Comparison of robotic-assisted and manual implantation of a primary total hip replacement. A prospective study. J Bone Joint Surg Am. 2003;85-A(8):1470-1478. Schulz AP, Seide K, Queitsch C, et al. Results of total hip replacement using the Robodoc surgical assistant system: clinical outcome and evaluation of complications for 97 procedures. Int J Med Robot. 2007;3(4):301-306. Chun YS, Kim KI, Cho YJ, Kim YH, Yoo MC, Rhyu KH. Causes and patterns of aborting a robot-assisted arthroplasty. J Arthroplasty. 2011;26(4):621-625. Callanan MC, Jarrett B, Bragdon CR, et al. The John Charnley Award: risk factors for cup malpositioning: quality improvement through a joint registry at a tertiary hospital. Clin Orthop Relat Res. 2011;469(2):319-329. Tsukada S, Wakui M. Decreased accuracy of acetabular cup placement for imageless navigation in obese patients. J Orthop Sci. 2010;15(6):758-763. Previous articleCementless Fixation: A New Gold Standard for TKA?